German food has never been my cup of tea. As a matter of fact, tea is actually my cup of tea. It's not that I don't like thinly sliced fried pork or sausage, it's just that I don't like how the German's go about it. Their dishes are too hearty for my simple tastes. If you are familiar with Penn Brewery, you know there have been an awful lot of changes over the years. The most recent change is the new menu. 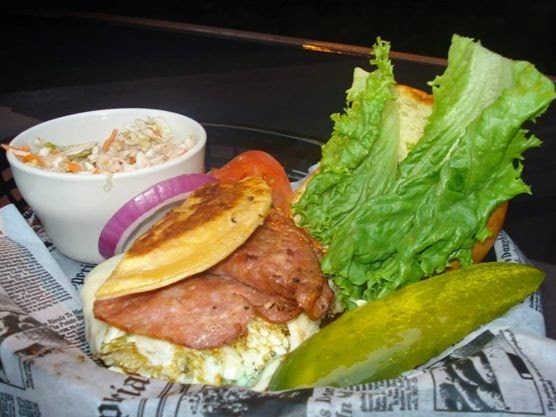 Pictured above is the Deutschtaun burger: a beef patty layered with muenster cheese, potato pierogi, sliced kielbasa, fried egg, slaw, lettuce, tomato, onion, and fries. Although, it sounded like awful lot of toppings for one hamburger, it was a natural choice for me as my family was living in Deutschtaun well over one hundred years ago. I was very surprised at how good the burger was. I wasn't impressed by the quality of the beef, but the toppings really worked quite well and made for a well textured and full flavored sandwich. The fried kielbasa added a nice salty zing while the potato and egg gave the burger a certain stick-to-your-gut goodness. Now for your Penn Brewery history lesson. "Penn Brewery sits on the site of the Eberhardt and Ober Brewery which was founded in 1848. Penn Brewery has played an important part in the history of the Pittsburgh beer and food scene. As of 1987 it was illegal to have a brewing facility connected to a restaurant. Owner, Tom Pastorius, successfully lobbied to change the laws and now you can brew beer and serve wienershnitzel all under the same roof." These ratty little breweries popping up in Lawrenceville better thank old Tom when they serve their patrons substandard hot dogs at exorbitant rates.